Is Warner Bros Looking to Add a Little Blue and Gold to Their DC Superhero Line-up? Warner Bros already has a stacked slate of films for their upcoming DC Cinematic Universe with titles like Suicide Squad, Aquaman, Wonder Woman and two Justice League films in the pipeline. But that doesn’t stop rumors of things like a new Batman trilogy starring Ben Affleck or a Man of Steel sequel from popping up. But the newest story making waves would definitely be a welcome addition to the lineup in my eyes. 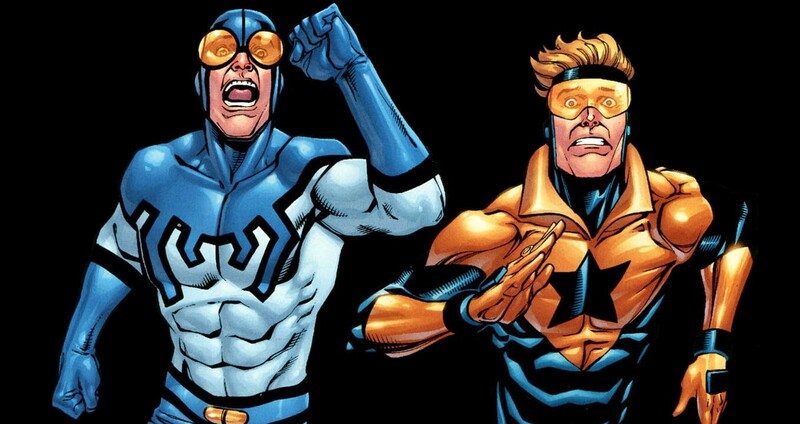 The Tracking Board is saying that Warner Bros is developing a Booster Gold / Blue Beetle movie with Arrow producer/writer Greg Berlanti directing. Heroic Hollywood got the news that Zak Penn would most likely be tapped to write the script. This film would differ from the rest of the announced projects as the studio is looking for something akin to a classic “buddy comedy” revolving around the Blue and Gold duo. Essentially this would be the equivalent of Marvel Studios Guardian of the Galaxy or Ant-Man in regards to the rest of the rest of the Marvel Cinematic Universe. If it’s comedy they want, they couldn’t have picked better characters. Comic book fans that know their four-color history are aware that Booster Gold and Blue Beetle are the greatest comedic twosome in DC’s history. They’ve been in the spotlight of various incarnations of the Justice League that highlighted the duo’s hijinks while they went up against a myriad of supervillains and even their own teammates. While no casting has been talked about, Nathan Fillion did talk to Comicbook.com voicing his interest in playing Booster Gold (or failing that, the classic fourth-wall breaking Ambush Bug). I think Fillion would be perfect. He shows great comedic presence in just about everything he’s asked to (just watch what he does in Joss Whedon’s Much Ado About Nothing and tell me he’s not the funniest thing in that film). As long as they don’t eventually go grim and gritty (like they did in the comics in the mid 00’s, totally changing the vibes of the characters for the worse) I’m all for a Booster Gold / Blue Beetle film. A lighter toned film could even help fans appreciate the rest of the serious projects that surround it. Keep checking back for more news as this story develops. This entry was posted in Breaking News, DC, Film and tagged Blue Beetle, Blue Beetle / Booster Gold, Booster Gold, DC, DCCU. Bookmark the permalink. Who’s on the Shortlist to Direct the Upcoming ‘Tomb Raider’?